Last summer I went away to a cabin by myself. My goal was to complete the memoir I’d been working on for two years. I didn’t realize that my weekend in the middle of the woods would also teach me the art of doing nothing. While I was there, I had no internet access, no TV, and no radio. I didn’t even think to bring any DVDs to watch on my laptop. All I had was a bunch of books, my laptop, marked up copies of my manuscript, and the forest. I struggled at first with the impulse to check Facebook and email frequently. I realized how dependent I’d become on those cyber connections to others, as if my day had more worth the more people connected with me online. The forest showed me that that simply was not true. I spent my days alternating between reading, writing, walking, and sitting. I tried to write as much as possible, to make the most use of my time, hurrying to produce something that I could distribute to the world. I felt a little guilty when I was reading, because it was for pleasure, but I needed something to break up the monotonous hours of leaning over my computer. There were a lot of places to walk where I was at, including a little prayer labyrinth near my cabin. So I’d walk and read off prayers from my prayer book or finger my prayer rope as I prayed for family members and friends. Again, I was focused on accomplishing something. I couldn’t just let myself walk in silence with a quiet mind and a quiet voice. 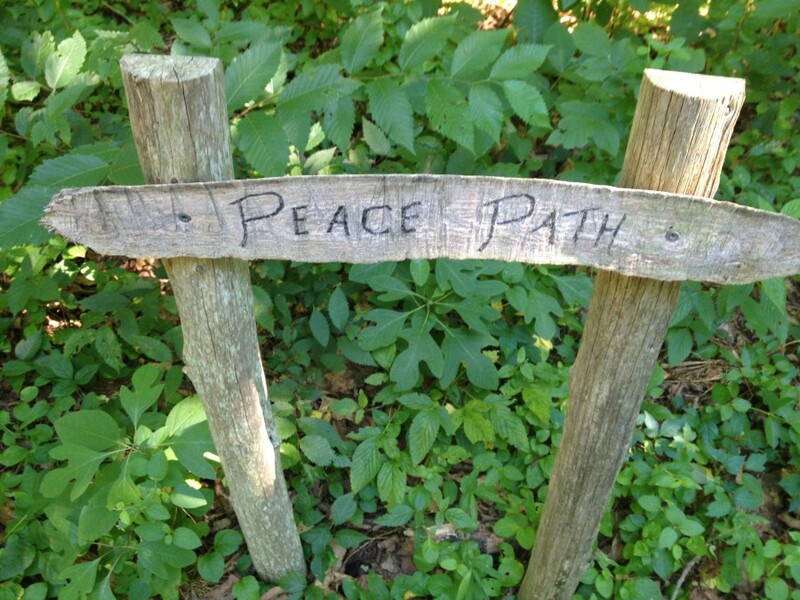 One day I ventured out to a little trail called the Peace Path. It was just a narrow muddy path through the forest, with a few fallen logs to step over and plenty of spiderwebs to duck. 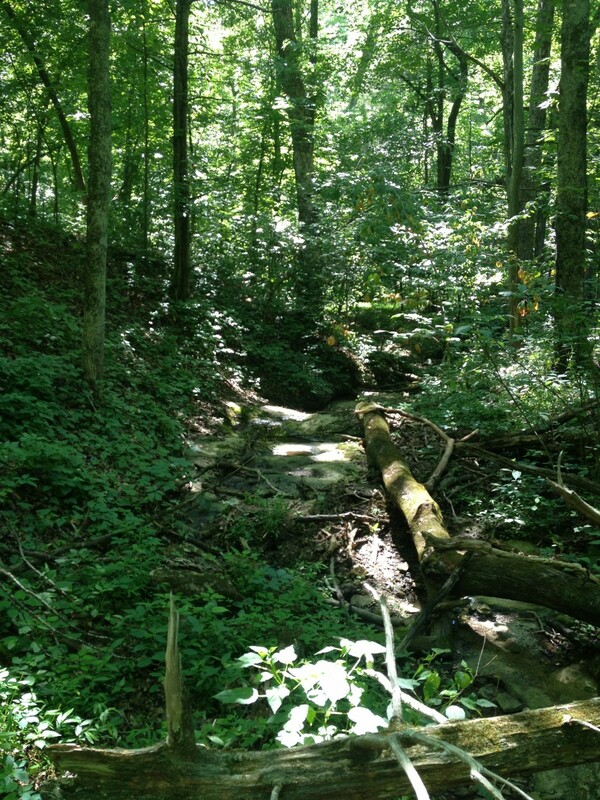 The path took me across a creek and then circled back around, and I found myself grabbing tree branches to keep me balanced in a couple of tricky places. When I got to the end, I realized I’d been so focused on the path that I hadn’t worried about doing anything else. I hadn’t prayed or thought deep thoughts. I had just walk and enjoyed the setting. And it felt good. It was the sitting and doing nothing that made me feel the most guilty at first. I would sit on that little enclosed porch and stare into the woods, watching for deer, listening for birdsong, following the movement of the leaves high in the trees. Yet after the first day, the feelings of guilt began to abandon me. My time of doing nothing, of just sitting and taking in the sights and sounds of the world, invigorated me like nothing else. I felt a deep connection to the earth, as if I were the wind tumbling through the trees, flying amidst creation. It turns out that it took doing nothing to help me get my bearings again. I did finish my book while I was at the cabin, but a couple of months after I returned from the trip, after no literary agent or publisher had responded, I decided to lay my manuscript aside for a while. I am still processing through all the reasons for that, but the truth is, now I am writing more things that I enjoy, and writing doesn’t feel like such a back-breaking and aggravating quest. Doing nothing gave me the freedom to see that. This is the first year in a long time that I’m doing nothing for Lent. Every Lent, Orthodox Christians fast meat and dairy. For 40 days. Yeah, it’s hard. I’ve can’t say I’ve ever done it absolutely 100%, but there have been years I’ve gotten pretty close. Every Lent, I make more of an effort to lead the children in prayers in the evening. Every Lent, I try to read at least one spiritual book. Every Lent, I pray the prayer of St. Ephraim daily. It is the prayer of my son’s saint, and I want to honor him. In the Orthodox world we are over one week into Lent, and I really haven’t done any of those things. I know what you’re thinking. You can, Karissa, you just won’t. Maybe that’s true. I keep thinking, this is what Lent’s about. Making sacrifices. Living simply. Reducing distractions. Focusing on what’s important. For me, this Lent is for staying still. I have wrestled and questioned and examined my faith over and over. I have gone through motion after motion. Now, it’s simply time for me to be quiet. It is time for me to do nothing. I will let the silence speak to me. I will wait for whatever is coming. I hope you can forgive me for my faithlessness. And I really hope that my priest doesn’t read this. If he does, I guess he will already know what I have to confess whenever I go to confession again. And I think he might tell me that there is grace even in the stillness and silence. The art of doing nothing is exactly this: sometimes doing nothing is the very path that brings you to where you want to be. You know I can relate, Karissa. I’m having a peaceful “lite Lent”… in which I do pray the Prayer of Saint Ephraim most days, because it’s such a touchstone for health spiritual and mental living. I don’t keep the prescribed fast, but I am trying to be more moderate in eating and drinking and generally denying myself some things. I missed all of the services of the church the first week of Lent, but this past Monday night I went to Compline and the candlelight flickering on the gold leaf of the icons and the music blessed me. Mostly I’m focusing on loving. Loving others and myself. Can’t go wrong there. Thanks for sharing these honest thoughts. I am not Orthodox, but perhaps you can just tell your priest you gave up Lent for Lent? I think as long as it’s an intentional act as you’ve described here, it’s should pass. Sometimes we need a break for the “shoulds” to appreciate the reason for ritual. Just my two cents. I really enjoy your writing. I am so glad you did a guest post for Mary Evelyn! this speaks to me so much, after 9 months of taking a break from church, i realise that i had lost my reasoning, and i was just feeling like it was what i ‘should do’, more than anything else. i now feel peace and freedom, and released from guilt, and when i DO go back, i feel only that i am there to be who i am, free from expectation – it is wonderful. Thanks for reading, Jennie. Giving up Lent for Lent. Sounds great! Knowing your priest, I have an idea he would say exactly that. Sometimes the most courageous path is to set aside those practices that have given us our identity, our sense of security, and see what’s left. Thank you for your honesty and vulnerability. I believe God will honor that. Jesus had no problem stepping away from everything and everyone who needed him to the recalibration and restoration of silence and loneliness. Blessings to you, lovely friend.